When it comes to food, I’m no angel. I’m blissfully happy indulging my palate with things that are bad for me. Succulent beef burgers, crispy bacon, fresh pasta, fried chicken wings, and delicate puff pastry are things I find it hard to say no to. The cruelest way to torture me would be to separate me from my favourite foods. 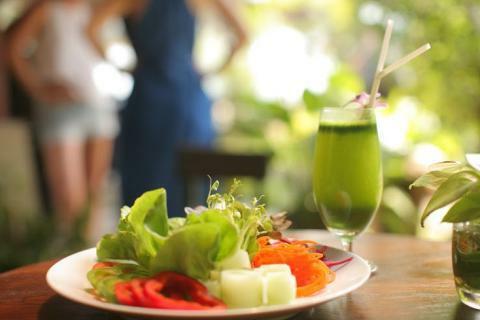 Therefore , when I checked into the Samahita Retreat in Koh Samui for a cleansing one-week detox program, I found myself staring at a vey thick detox guidebook, a daily schedule of detox herbs, pills, and colon cleansing, and I’m sure I heard my stomach howl in fear. As a first time detoxer, I’d been filled with dread weeks before starting the program, which meant restricted food intake to cleanse the body of toxins that had accumulated from years of fatty foods, caffeine, alcohol and processed snacks. Before arriving at the retreat, I’d been sent a comprehensive Pre-Detox Questionnaire asking about my eating habits, health, medical, mental/emotional condition, and a detailed Pre-Detox Guideline on how to prepare for the regimen to come. Most importantly, it asked what were my goals for the detox program, which helped dissipate my anxiety and focus on what I wanted to achieve from this experience (my goals were: improve general health, clean my system, get more energy, lose a bit of weight). Arriving at Samahita, I found that I was no different from the other guests, who were all in pursuit of better health and more energy. Unlike what’s often portrayed in movies, it’s a cliché to expect a wellness yoga resort to be filled with herds of middle-aged, graying hippie women mindfully chewing on tofu. At Samahita Retreat there was a good mix of men and women ranging their early 30s to 40s. There were a few guests in their 50s, both men and women. Many of them were solo travellers in their 30s, were stressed out urban professionals, had never done yoga or been to a health resort before and were there because they wanted to take more control of their health or find a better way to manage their stress. The atmosphere was relaxed and social in the open-air dining room where the guests quickly bonded at community tables over healthy buffet meals. I usually took a sunset walk up and down the beach. The Samahita beach yoga shala is behind the chairs on the right. Located on the quiet southern shores of Koh Samui, Samahita Retreat is a short drive but a world away from the island’s celebrated party scene. Among Samui’s many wellness retreats, Samahita is distinctive because it’s a well-known Ashtanga yoga resort and international yoga teacher training center, rather than specifically a detox retreat. Founded by American yogis and married couple Paul and Jutima Dallaghan. 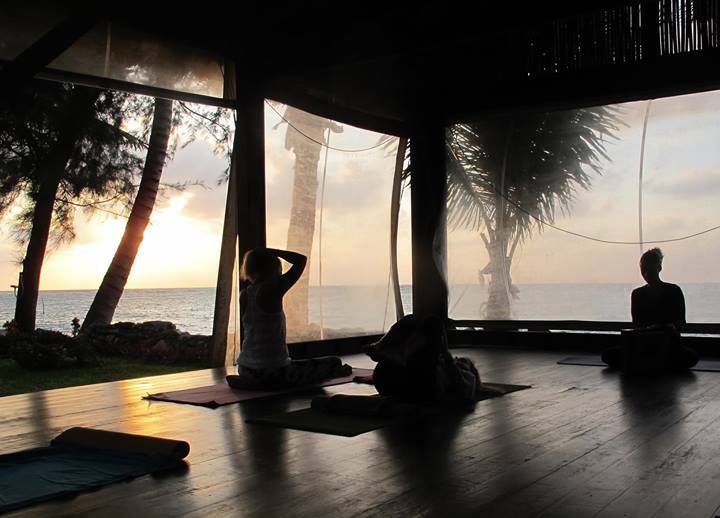 Samahita offers a range of yoga retreats, yoga teacher training, detox, de-stress, and weight-loss programs, in a boutique resort setting on a pristine secluded beach. I had chosen Samahita because of its reputation as a serious Ashtanga yoga center. I was more interested in the yoga than the detox, and was hoping to get lots of yoga classes during my stay, and just try to get the detox over with. But it was far different from what I’d expected. I’d arrived fearing that I’d suffer from hunger but in reality, hunger was the least of my problems. For the first few days, I lay in bed with painful, horrible detox symptoms – throbbing headaches, nausea, and fatigue that were so uncomfortable that by the second day I was clutching my head and wanting to go home. I felt so sick I could barely stand up, let alone go to a yoga class. Whatever free time I had between my appointments in the wellness center were spent in my room napping before running back to wellness center for the next detox meal, detox juice, or detox spa session. Actually, I was lucky and had this suite with spacious kitchen, full size fridge, and living room. Usually this room is good for families or long-stay guests. Ivana, the fantastically fit and wonderfully supportive Wellness Director who supervised our daily wellness consultations appeared every morning at breakfast and talked to each person individually about their progress and any questions they might have. She explained that the first few days were the worst as the detox herbs were flushing the toxins out of our cells and into the bloodstream, which caused the headaches and nausea. I also found that blurred vision was one of my detox symptoms. Other detoxers experienced other symptoms such as bizarre dreams, and the release of repressed emotions like anger and grief. Caffeine withdrawal was a major cause of splitting headaches. I walked down this pretty green path to the wellness center and beach every morning. It was a normal sight in the wellness center lobby to see detoxers draped groggily over cushions, lying supine on the sofa, or clutching their heads while waiting for their next appointments. Limp bodies were draped everywhere like boneless chickens. I was one of these people too. One day I waited for a massage appointment with my head flat on the reception desk because I was too nauseous to sit up straight. I felt sick and wanted to run crying back home. Did I say that already? The wellness center staff are used to this sort of thing and were very supportive. They would bring out a little concoction to help ease the headaches if it got really bad. The toxins were then flushed out of our bodies through sweat, urine and bowel movements, which were accelerated by a regimen of fasting, detox juices, herbs, daily enemas, colonic cleansing, abdominal massages, detoxifying Far Infra-red Sauna sessions, and massages to eliminate the wastes from the body. Strangely, the hunger that I’d dreaded so much never materialized. The constant intake of herbs, pills, fruit and vegetable juices, psyllium and bentonite clay filled our stomachs and left us feeling full all the time. The greatest challenge was the boredom of eating the same dish of steamed vegetables or lentil soup, three times a day, every day, for seven to ten days. My daily detox breakfast. Same menu every day for the whole program. It was fresh and delicious. Our small group of detoxers were on Samahita’s different types of detox programs to suit various needs and detox levels. We usually ate our special detox meals in the wellness center, separated but still within sight of the main dining room. Since we were usually in and out or around the wellness center every day, we easily bonded and over our shared experience. Food boredom became a recurring theme and fantasizing about forbidden foods became a silly game we liked to play. This was instigated by Paul, an early 30’s international trade consultant from the UK. Paul was good looking, friendly and popular, and liked prodding people to choose among hypothetical food vices (“which would you choose, Pizza Hut or Domino’s?”). He told me Kentucky Fried Chicken was made of camel meat and that he was once forced to eat it out of desperation in China because he had 20 minutes before a business meeting, was starving, and it was the only food he actually recognized because everything else was written in Chinese. There are much scarier things to eat in China ( barbequed starfish, anyone? How about grilled seahorse on a stick with the head looking at you? Or snake bile duct freshly ripped from the live snake? I could go on – but let’s not go there.) but Paul said this was the worst thing he ever ate and he felt utterly awful afterwards. I was horrified. I feel physically sick after eating any product from McDonald’s but I had always liked (no, loved) KFC. I didn’t believe the camel meat claim but all the same, I started avoiding KFC after the detox. (Later I told my sister what Paul had said and she said “don’t be ridiculous, it’s chicken!”). I watched my fellow detoxers on a different detox program eat this every day. This program did not include fruit or sugar. We spent the days in the wellness lobby discussing international foods, like the crispiness of kimchi pancakes with Na Jung the luxury fashion marketer from Seoul; the crustiness of freshly baked bread with Caroline, the French chef; and the juiciness of grilled beef with Santiago and Frederico, the hot Argentinean guys. One evening while Paul described a seemingly endless chocolate pudding fantasy, I watched Caroline the French chef slowly consume her dinner, which was a bowl of clear liquid that she said was boiled vegetable water. It looked like plain water to me. She was eating slowly, sloooowly, spoon by spoon. Maybe she was trying to make it last longer, like an actual meal. I was nursing my usual bowl of soup. From our seats in the wellness center we could see the non-detox regular guests in the nearby dining room laughing and chatting around the buffet. “Isn’t it strange how we are all in the same beautiful place…yet I’m sure those laughing, happy, shiny people over there in the dining room are having a completely different experience from our detox experience over here,” I remarked to fellow detoxer Paul, who nodded glumly into his raw sprouts. “I feel hangry,” said Caroline, with her French accent. I was confused and didn’t know if she was angry or hungry. “Um…who are you hangry at?” I asked her. She didn’t look angry or hungry, but after my question she looked confused. “I am hangry” she said again, with a Gallic shrug. The experience made us realize that our obsessions with food were mostly mental, not physical. We all realized that we spent a lot of energy thinking about food, even though we weren’t physically hungry. It also makes us become very aware that we often eat not because we are actually hungry but simply because it’s a habit or because the food is there. Going on a detox makes you much more conscious of your own relationship with food and how and why you eat certain foods. I realized I sometimes ate out of boredom rather than hunger. I also had a bad habit of snacking on crunchy foods while watching TV (the same way some people need popcorn while watching a movie). The buffet menu changes daily. Though the aroma of baking brownies sometimes wafted from next door kitchen, nobody strayed from the detox regimen as everyone was determined to reach their health goals. Our collective goal was to make it to the end and then emerge like freshly hatched chicks. As Ivana had said, the worst of the detox symptoms eased after a few days, and seeing little stones of green cholesterol plaque expelled after the liver flush gave me visible proof that the toxins were being cleaned from my system. With daily yoga classes and long walks on the beach, most of the detoxers lost weight quickly, with the men losing on average 4 kilos a week and the women losing 1- 2 kilos, though I lost no weight at all. Post detox, we were advised to gradually introduce normal foods into our diet over the course of a week. After a few days back home, the results of the detox were apparent. My body felt light and weightless, less sluggish, more energetic, and most amazingly, my eyesight suddenly became sharper and clearer than ever before. Other detoxers said they were amazed that they could suddenly smell better or hear better as a result of the detox. And of course, everything tasted better. My mood was less negative and more serene. My body felt so clean and so light that I didn’t want to sully it by eating any kind of heavy food or animal meat. (However this feeling eventually wears off after a few weeks when you are back in the real world surrounded by everyday real food). 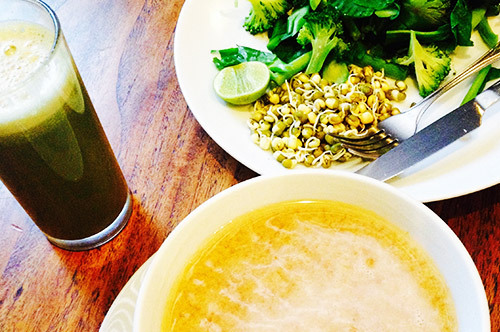 Feeling clean and light after the detox – yay! The new, improved me became more conscious of how certain foods affect my energy and moods, and stopped using coffee as a substitute for breakfast. In fact, the new me avoided coffee, shied away from red meat, alcohol, milk and cheese, and stuck to lighter Asian fare of rice, vegetables and fish. Not forever though. Just until the day I decided to surrender to a plate of crispy bacon. BOOK YOUR STAY – Get all their packages, best price guaranteed, advice on planning & travel, and book online here. Have you been on a detox retreat? What did you discover on your experience? Previous Post FOLLOW BAREFOOT LUXE!